The NHL’s Feb. 25 trade deadline is just three weeks away. As expected, several players are frequently popping up in the rumor mill as possible trade candidates. Here’s a look at the notable names and their potential suitors, based on recent media reports. Panarin’s decision not to discuss a contract extension during the season has some pundits suggesting the Blue Jackets could move him before the trade deadline. Sportsnet’s Mike Johnston cited Nick Kypreos reporting the Florida Panthers are interested in Panarin. 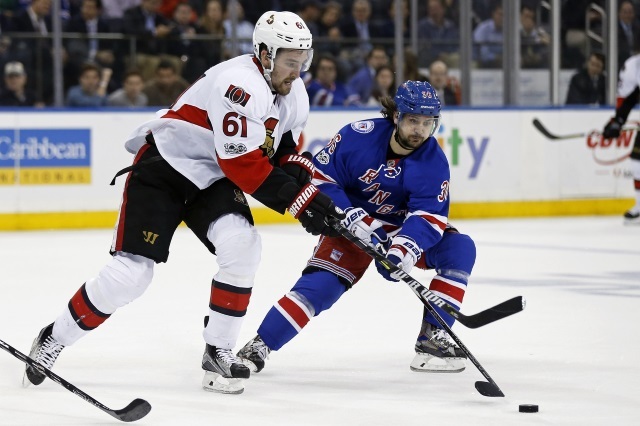 There’s speculation they could package recently-acquired center Derick Brassard as part of a larger deal for the skilled winger but that seems unlikely. TSN’s Darren Dreger wondered if the Colorado Avalanche might make a pitch for Panarin. The Boston Bruins, New York Islanders, New York Rangers, and San Jose Sharks have also come up as possible destinations. Like Panarin, both are slated to become unrestricted free agents in July. The Senators are attempting to re-sign them but could trade one or both if they’re not under contract by mid-February. TSN’s Darren Dreger suggested the Bruins as a landing spot for Duchene. The Carolina Hurricanes, Nashville Predators, and Winnipeg Jets could also make inquiries. Because Stone seems more likely to re-sign than Duchene, there’s not as much talk about which clubs could pursue him. That will change, of course, if he hits the trade block. The Winnipeg Sun‘s Ken Wiebe thinks the Jets could be interested if he becomes available. Perhaps the Bruins or Dallas Stars will come calling. It appears only a matter of time until the Flyers ship out Simmonds, who’s also eligible for UFA status in July. While it’s believed he’d love to stay in Philadelphia, the Flyers seem reluctant to invest in a long-term deal for the 30-year-old winger. The Boston Globe‘s Kevin Paul Dupont recently pondered the cost for the Bruins to acquire Simmonds. TSN’s Darren Dreger speculates the Tampa Bay Lightning might look into his availability. Simmonds could also draw the attention of the Predators, Stars, Jets, and the Avalanche. A young power forward coming into his own, the 26-year-old Ferland is said to be seeking a contract comparable to Tom Wilson’s six-year, $31-million deal with the Washington Capitals. That’s too rich for the Hurricanes, who could seek a first-round pick for Ferland before Feb. 25. TSN’s Darren Dreger suggested the Lightning could have interest in Ferland while colleague Frank Seravalli thinks he’d be a good fit with the Maple Leafs. He’s also been linked to the Bruins, Predators, Pittsburgh Penguins, Calgary Flames, and Vancouver Canucks. Like everyone else on this list, Hayes and Zuccarello are due to become UFAs in July. With the Rangers rebuilding, it’s unlikely either guy will be re-signed. Larry Brooks of the New York Post mused about possibly sending Hayes to the Blue Jackets for Artemi Panarin but thinks he’ll be dealt for a package of future assets. There was talk linking Hayes to the Avalanche but Sportsnet’s Elliotte Friedman cast doubt on that possibility. TSN’s Dave Poulin suggested the Jets as an option. Brooks also reported the Penguins were looking at Zuccarello, whose production has picked up in recent weeks following a slow first-half performance. The Stars and Edmonton Oilers have also been mentioned as a destination.